Grimy 56091 works light engine through Doncaster on January 3rd 1989. The 26 Class 09/0s spent most of their working lives allocated to the Southern Region so I have few photos of them. 09025, unofficially named 'Victory' was unusual in not carrying high-level air pipes. It is seen here at Portsmouth Harbour, shunt releasing stock. This image hasn't scanned well but is worthy of inclusion for the details apparent on 09010, seen shunting 'Turbot' wagons at Woking on 16th February 1989. 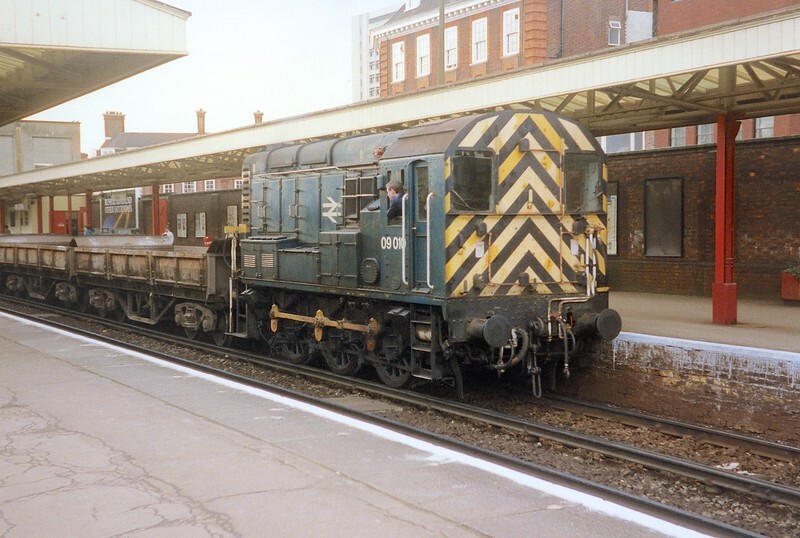 Note the loco carries its builders plate (Darlington 1959, as D3721), high-level air pipes, the original (wooden) cab door, and a full set of marker lights. It was withdrawn in 2010 and preserved. 50003 'Temeraire' was always my favourite locomotive. 16th February 1989 found it in charge of the 1V15 1510 London Waterloo - Exeter St. Davids, seen here prior to departure from London. 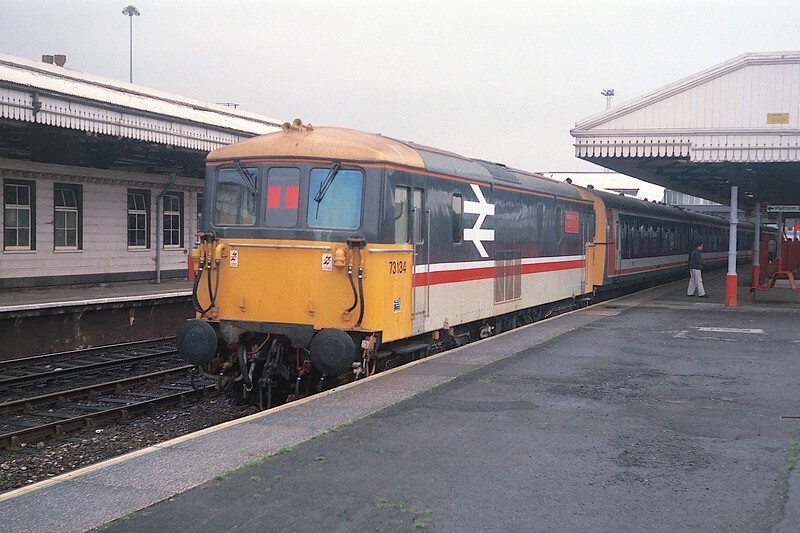 Prior to delivery of new class 442 stock, the 4-REP tractor units that operated with 4-TCs on the Bournemouth route had to be withdrawn, since the traction motors were being re-used in the new fleet. This led to the temporary use of pairs of class 73s operating with the TC stock, as seen here at Woking on 16th February 1989. 73104 and 73129 'City of Winchester' are about to head out in to the dusk, on an afternoon working from London Waterloo. 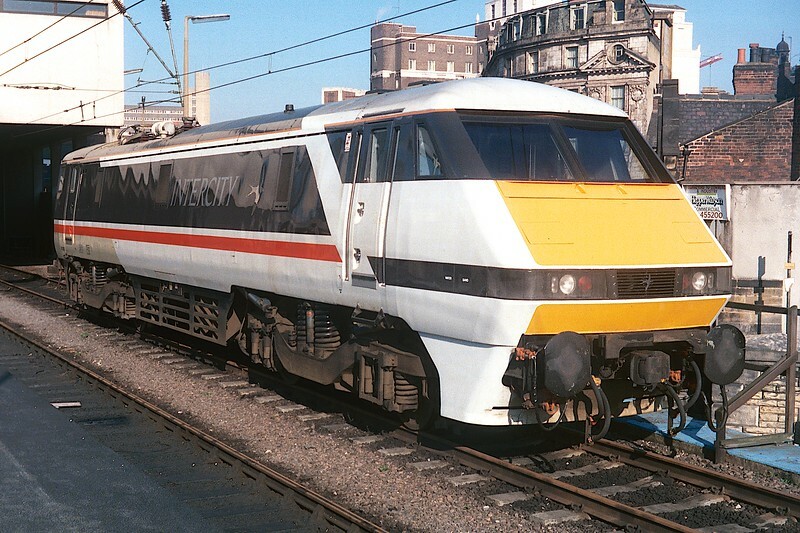 89001 'Avocet' looked stunning in InterCity livery. 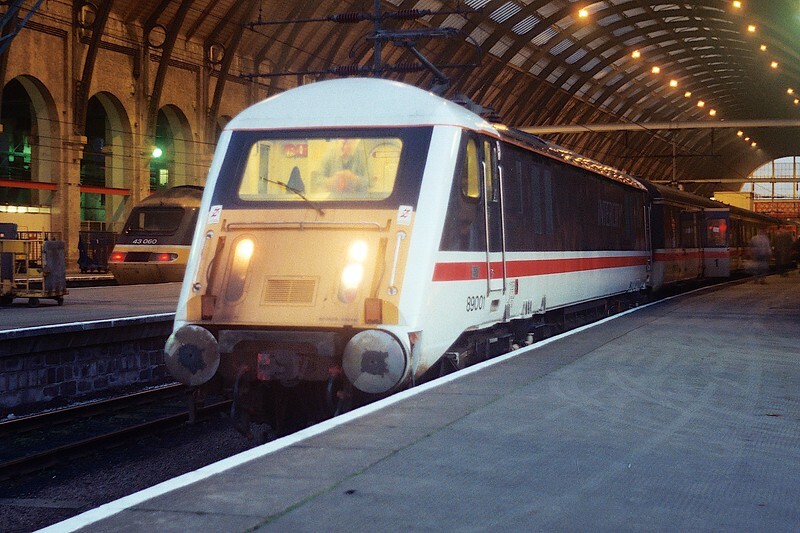 It is seen here at Kings Cross on 16th February 1989, with what I assume to be the evening commuter turn to Peterborough. 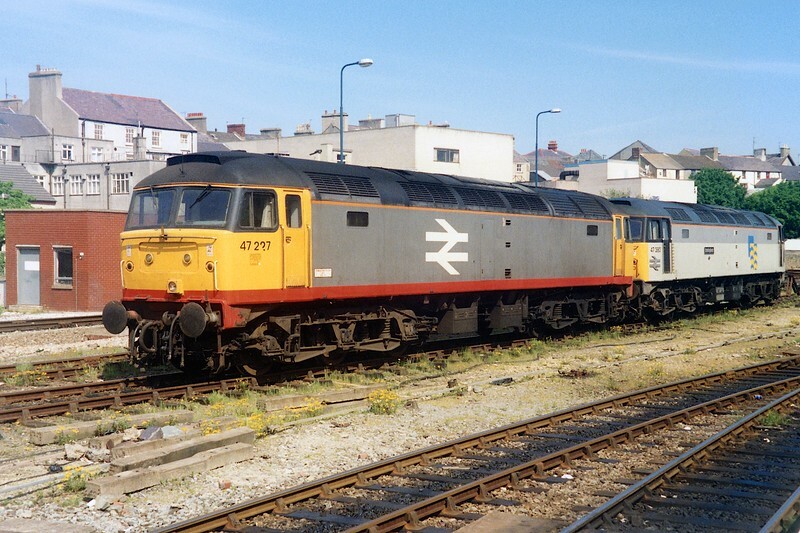 The six Cardiff Canton allocated class 37/4s saw use in Mid-Wales, Cardiff-Weymouth and, as here, Cardiff - North West trains. 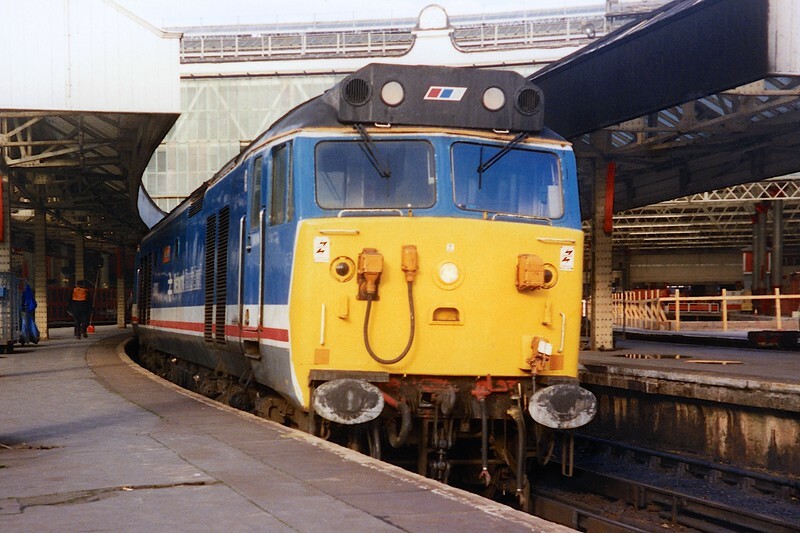 This is Manchester Piccadilly on 11th March 1989 and making ready to leave with the 1V09 1000 to Cardiff Central is 37426 'Y Lein Fach / Vale of Rheidol'. What a lovely sight! The loco was new as D6999 in August 1965 and carried 37299 before ETH-conversion to 37426 in February 1986. It was cut-up by CF Booth, Rotherham, in 2013. 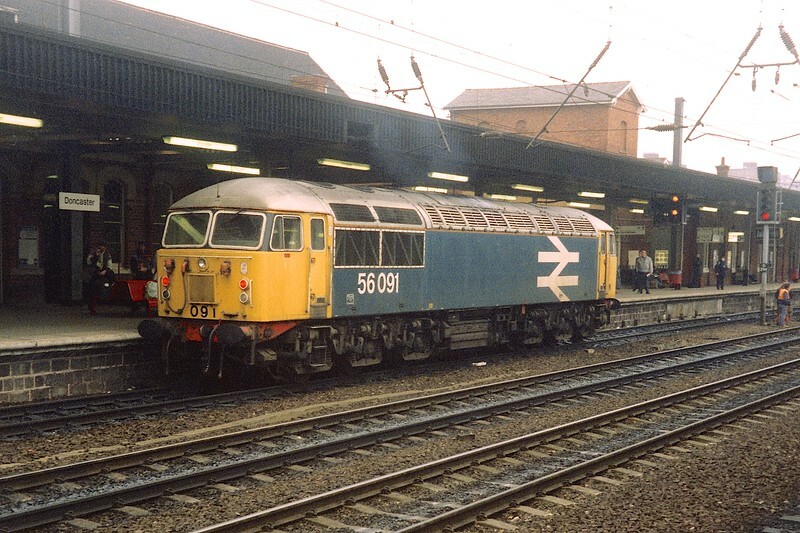 Saturday 11th March 1989 sees 58007 stabled for the weekend at Bescot, West Midlands. 58001, '003, '011 and '017 were also present, whilst 58004, '005, '009, '010, '013, '014, 015 and '029 were at nearby Saltley. That's over a quarter of the fleet! 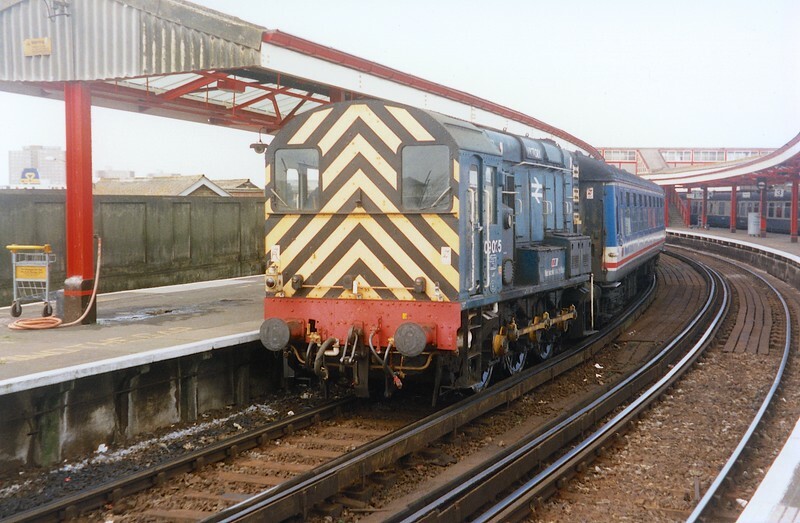 The loco was just over five years old, being delivered in Feburary 1984. One of my best shots of a class 58! A fine shot of InterCity 'Swallow'-liveried 90022 at Stafford from 11th March 1989, working the 1M56 1155 Plymouth - Manchester Piccadilly. The Skoda had worked the train forward from Birmingham New Street, having taken over from a class 47/6. The loco was less than a month old at the time. 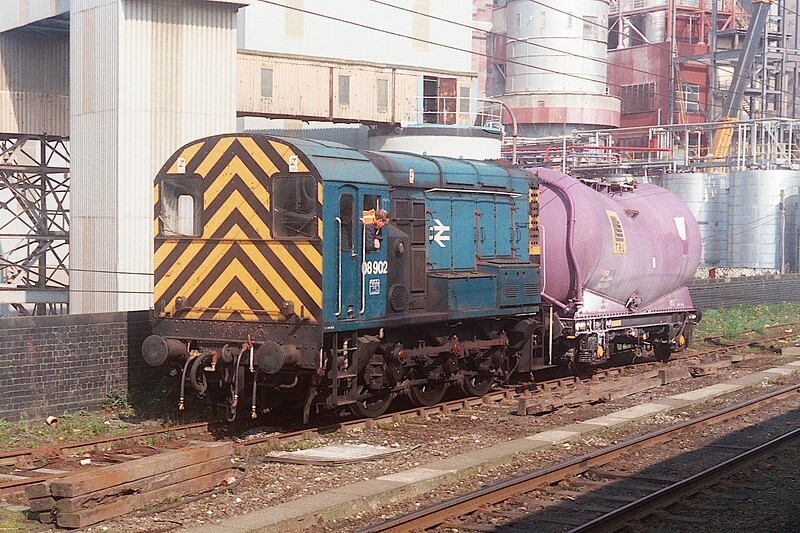 Birkenhead North was the last mainland depot to retain class 03 shunters in normal service, and these were withdrawn by May 1989 (a pair lasted until 1993 on the Isle of White). They were used to shunt the tightly curved tracks of Birkenhead Docks and I made a special trip to photograph the last three survivors on 24th March 1989. This shot is the best I could do: green 03162 stands with blue 03073 and 03170. Also in shot are a pair of the MerseyRail battery electric units, 97701-97702. 03162 was new from Swindon Works in September 1960 and was repainted green in 1987. It carries the painted name 'Birkenhead South 1879-1985'. All three locos were preserved. A busy scene at Warrington Bank Quay from 30th March 1989. 47365 'Diamond Jubilee' stands to the left. 20195 trailing 20158 have been 'called on' behind a West Coast express. 20195 wears the 'Civil Engineers' yellow flash above the number - sectorisation! 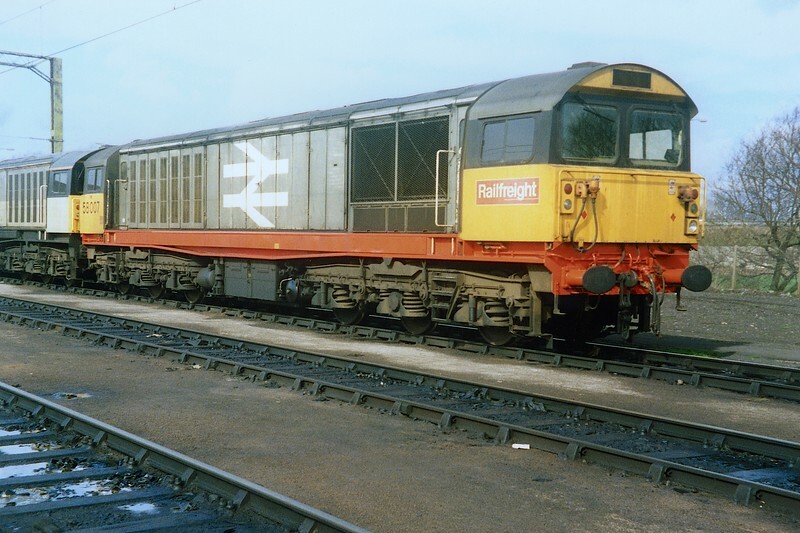 37063 wears the Railfreight Distribution version of 'the 1987 Triple Grey' livery when seen at Warrington Bank Quay on 30th March 1989. Delivered on 17th March 1989, 90025 - the last of the 25 'Swallow' liveried class 90s - is seen when less than two weeks old at Warrington Bank Quay on 30th March 1989. The next eleven locos appeared in 'Mainline' colours. This image hasn't survived well, but since the loco was repainted by 1992 I've included it for rarity value. 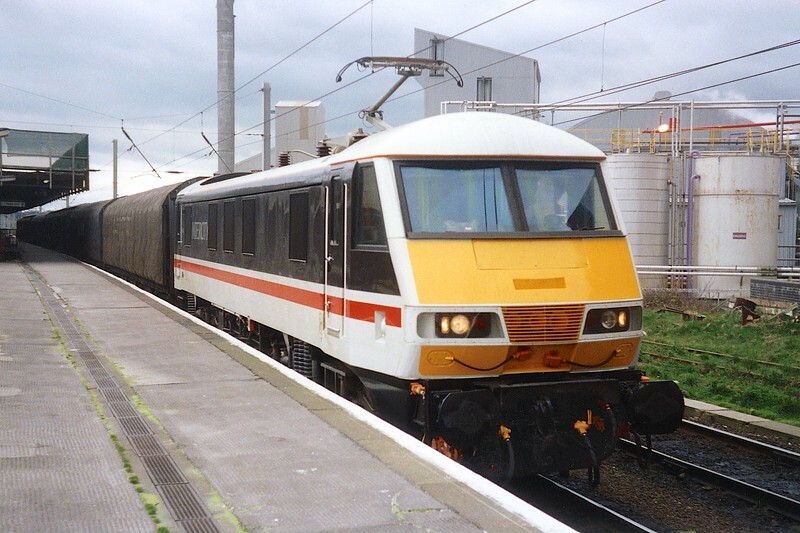 This image hasn't survived too well, but is a full-sun shot of a class 90 in original condition. This is, I think, 90003 at Wilmslow on 1st April 1989. 37431 'Sir Powys / County of Powys' is seen at Cardiff Central on 3rd April 1989. 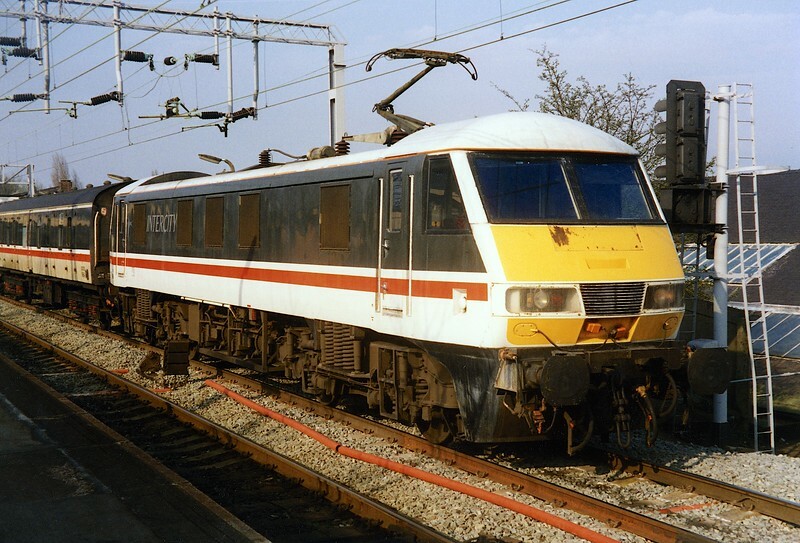 The 91s entered traffic in March 1989, initially with mark III stock and HSTs acting as 'Surrogate DVTs'. The following month I made a trip to Doncaster and enjoyed my first haulage by the class, catching 91007/43084 south from Leeds. 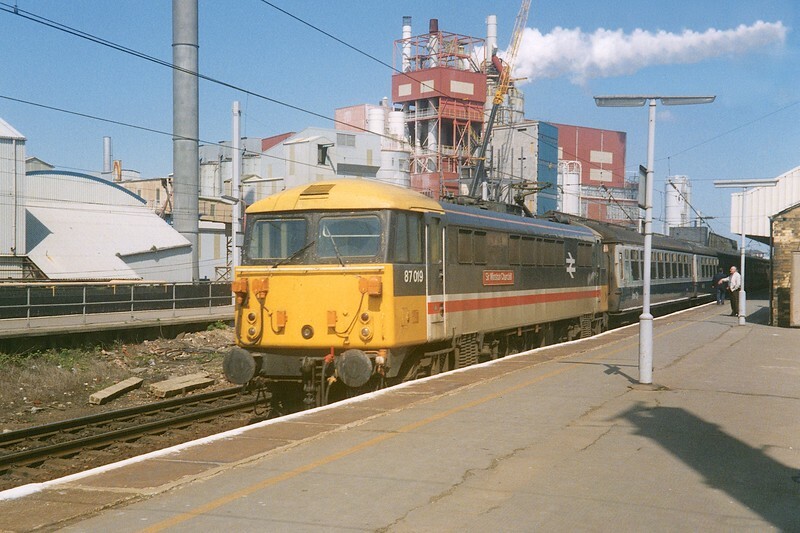 Also at Leeds that day, 15th April 1989, was 91008 - a 'cop', and a fine sight sitting in the sun in an east end bay platform. At this time, only small TOPS numbers were carried - on the blunt end. 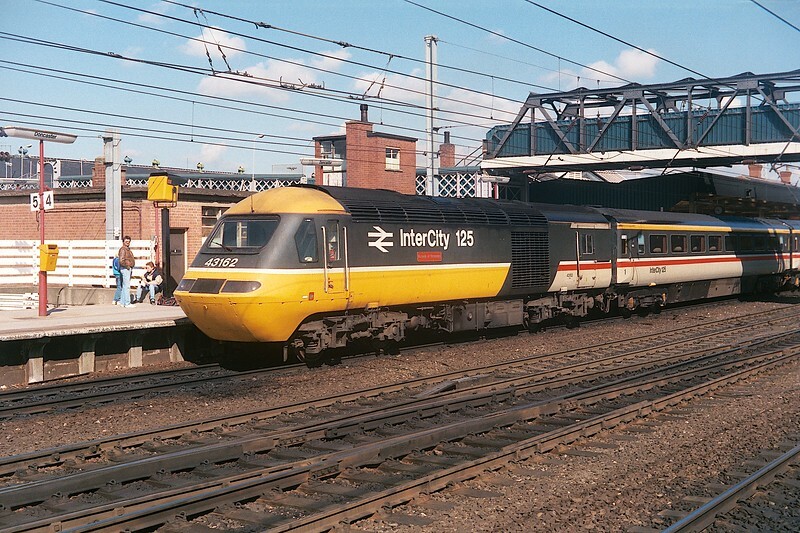 91007 arrives at Leeds from London Kings Cross on 15th April 1989. Note that the stock is Mark III (and 'surrogate' DVT 43084 was on the south end). 08745 stands in the parcels sidings. 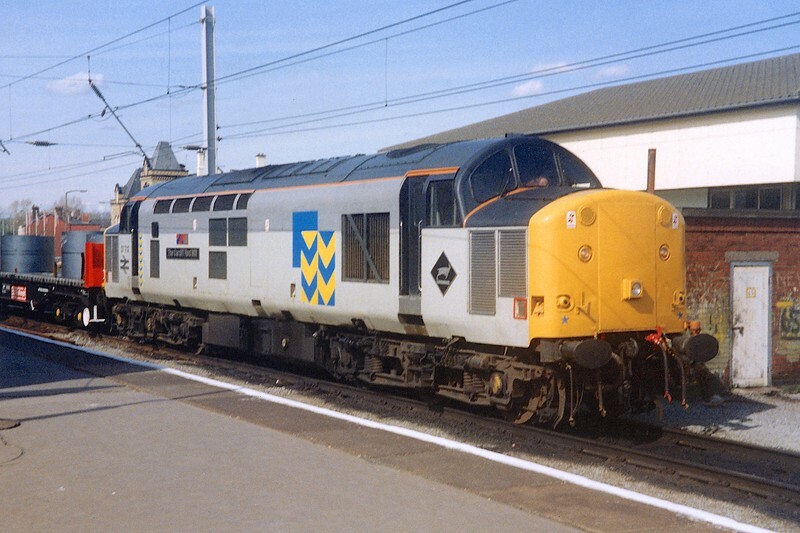 A splendid image of 43162 'Borough of Stevenage' at Doncaster on a sunny 15th April 1989. 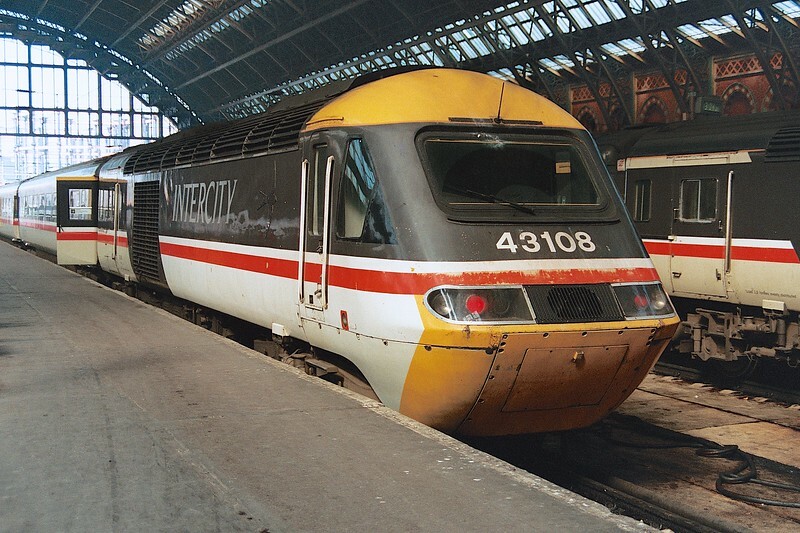 The power-car wears the first iteration of 'InterCity' livery, with the '125' branding. 43103 was leading this train. 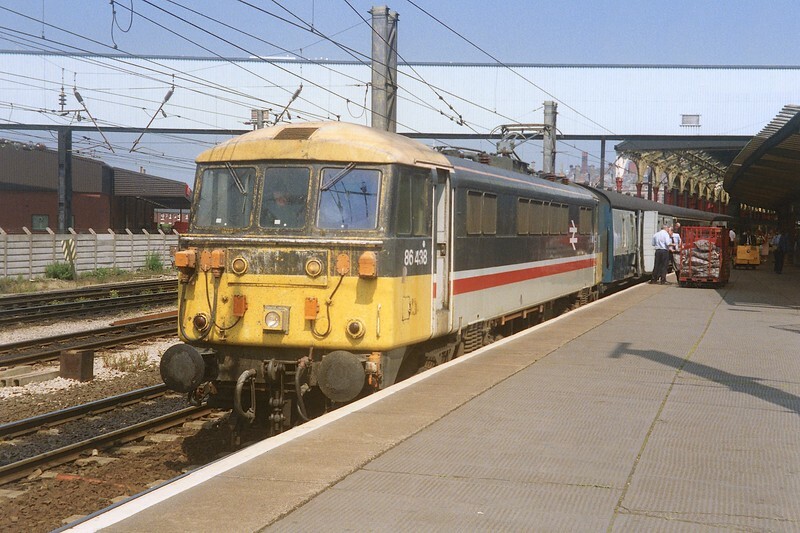 Oh for a time machine, to revisit with better camera equipment this sunny Friday 28th April 1989 in Warrington. First, we see class 08 08902 shunting a Lever Brothers-liveried PCA tanker adjacent to the station, and into the Lever Brothers works. Note the shunter's pole across the buffer beam. 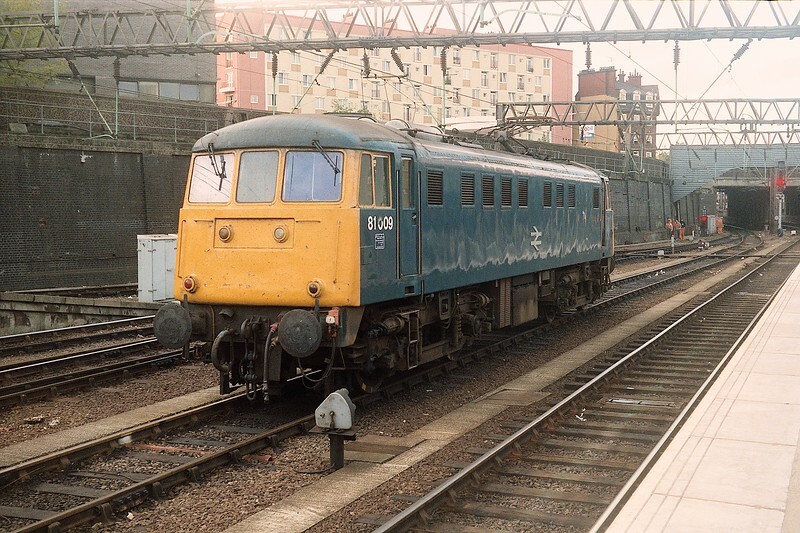 This was an Allerton-based loco, and 08902 was based there for over a decade from July 1986. Passing under Warrington Bank Quay station on 28th April 1989 are Toton-alloctaed 20106 and 20006. They are hauling a rake of empty MGR hoppers, almost certainly from Fiddlers Ferry Power Station. 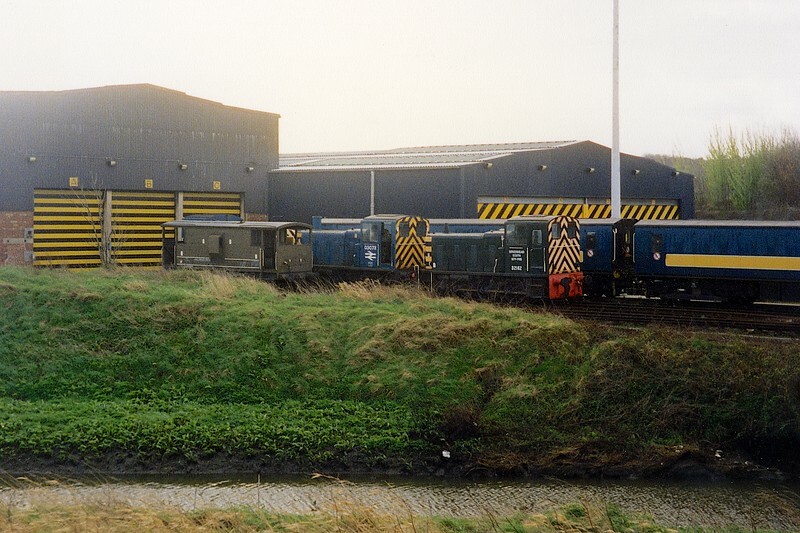 Steel coil trains between Ravenscraig and Shotton (Dee Marsh) - loaded 'eye to sky' as here - changed locomotives from electric to diesel power at Warrington in 1989, before full sectorisation demanded 'Metals' locomotives work throughout. Thus 'Heavyweight' 37712 'The Cardiff Rod Mill' has just backed on for the remainder of the journey. The loco had been renumbered on refurbishment from 37102 the previous August, been named in the November., and stills looks smart in trainload grey. It survived to see service with West Coast Railways in the privatisation era. 87019 'Sir Winston Churchill' wears InterCity colours and looks smart at Warrington Bank Quay on 28th April 1989. This photo has required some editing to smarten it up. You can almost smell the soap from the Unilever works; always a feature of spotting at 'Bank Quay! 47227 in 'Red Stripe' and 47380 'Immingham' in Trainload Petroleum colours are seen stabled at Holyhead on a sunny 27th May 1989. 47380 is a little further from home, and an unusual sight in North Wales, compared to '227 from the local Crewe Diesel fleet. 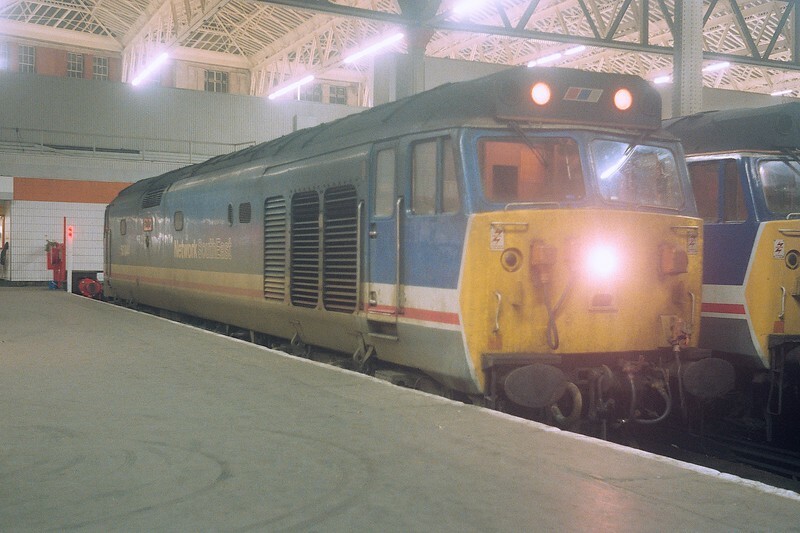 43108 rests at London St. Pancras on 3rd July 1989. 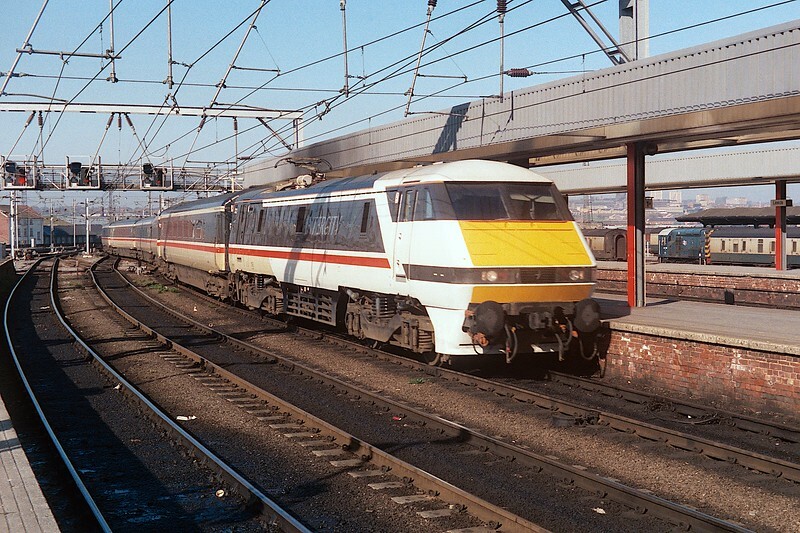 InterCity 'Swallow' livery suited the HST power cars well. 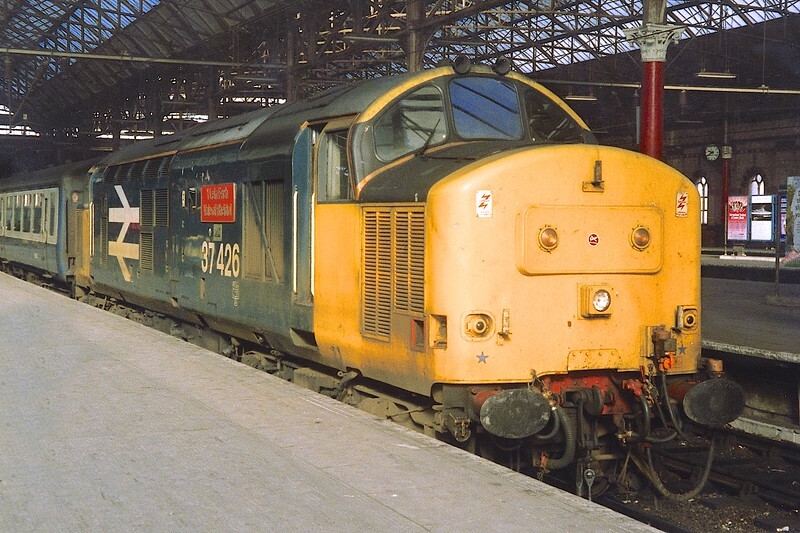 A fine image which sums up my childhood spotting days at Preston. An everyday scene, which I guess i shot because the sun was so perfect, if also a little unusual to have a southbound train in Platform 3: this may have been a Blackpool service changing traction to 86438. My favourite aspect: the BRUTE trolley and loading mailbags; something no longer seen. The date was Wednesday 19th July 1989. 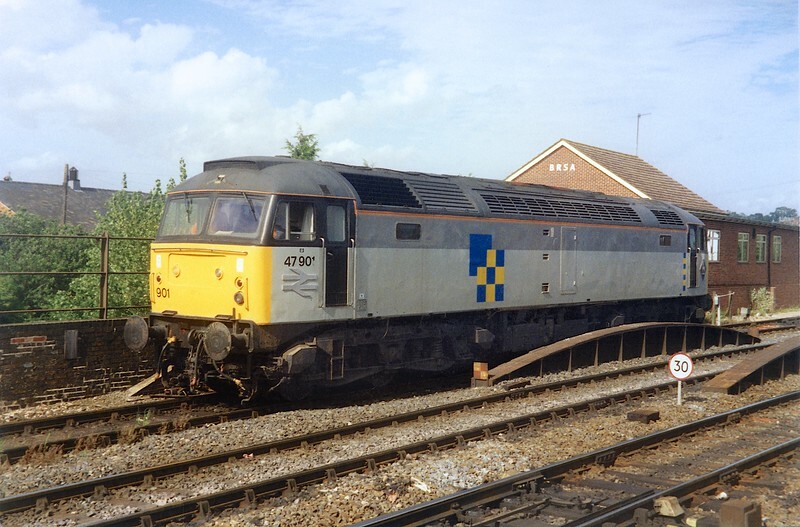 A shot I've included for rarity value: 47901 is seen passing light engine through Salisbury on 15th August 1989. 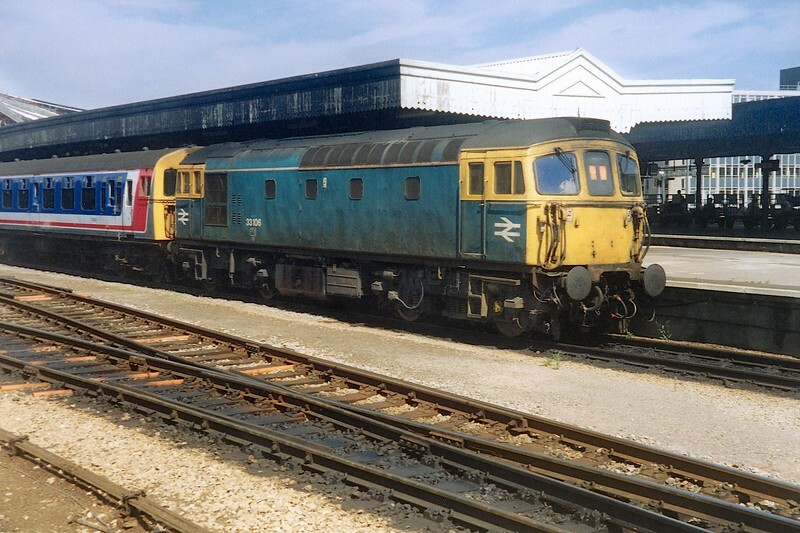 Delivered in 1964 as D1628 and later 47046, the loco was selected to test class 56 equipment in 1975 as 47601, and class 58 equipment from 1979 as 47901. Seeing final use on Mendip Stone traffic, it was withdrawn as non-standard in March 1990 and cut at MC Metals, Glasgow by February 1992. 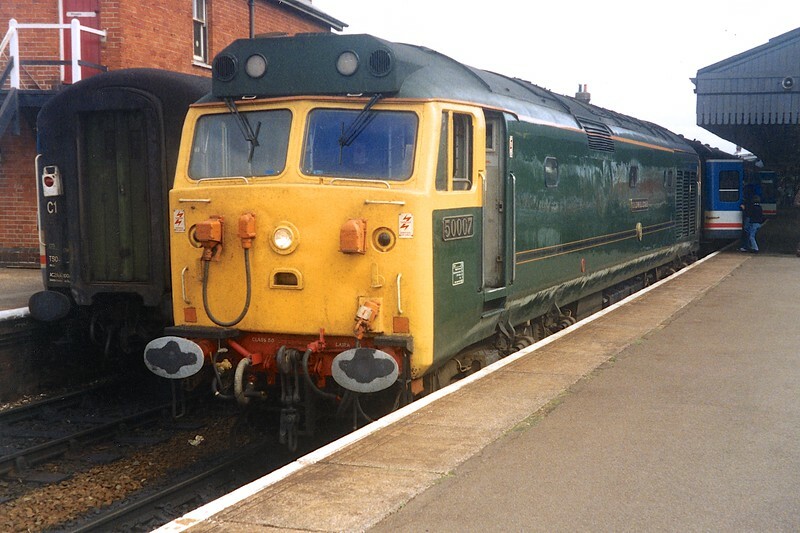 Celebrity-green class 50, 50007 'Sir Edward Elgar' pauses at Salisbury on Tuesday 15th August 1989 with the 2V13 1315 London Waterloo - Exeter St. Davids service for NSE. 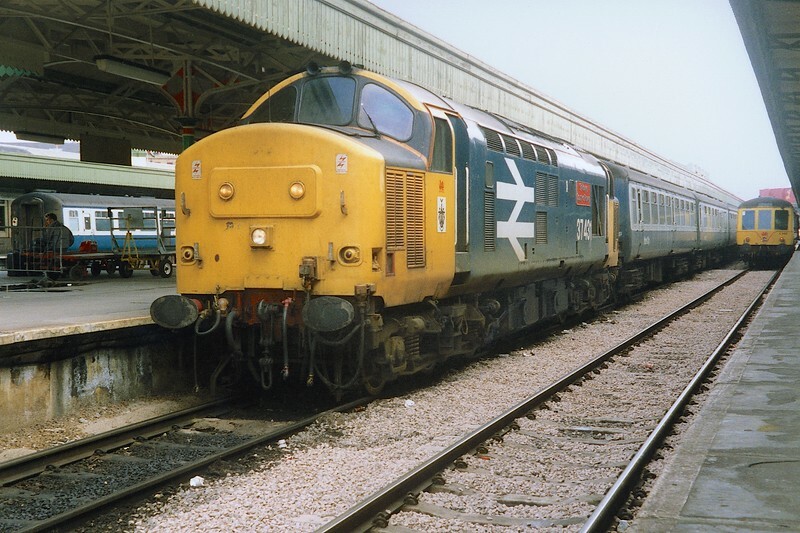 The versatile combination of 33106 and a 4TC set will work the 2O90 1330 (Saturday) Bristol - Weymouth service on 19th August 1989, seen awaiting departure from 'Temple Meads. 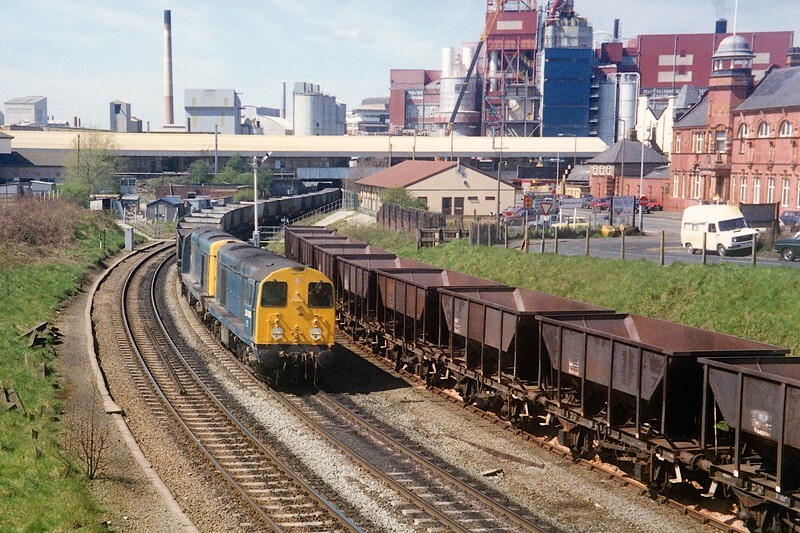 This is Newport Godfrey Road stabling point on Saturday 19th August 1989. 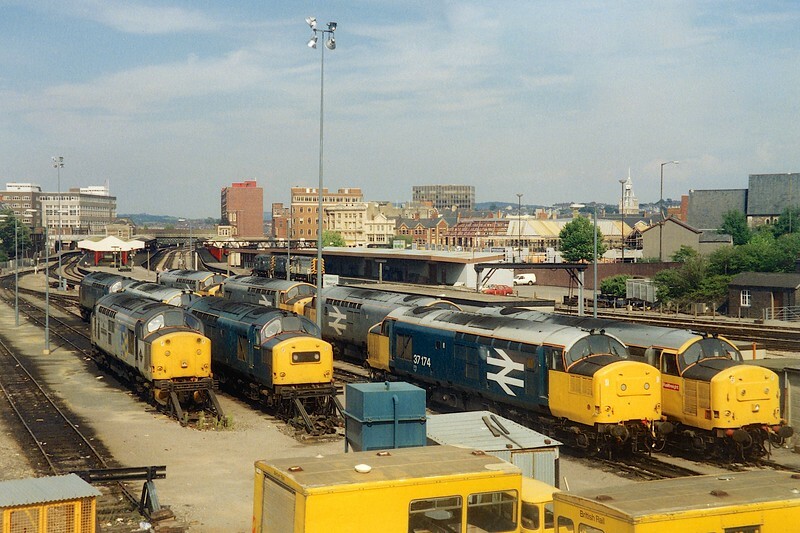 There are nine class 37s (and one out of shot to the left), and three shunters visible: the latter are 08668 and 09008 in blue, and 08950 in 'triple grey'. Prominent centre-stage is 37174 in 'Revised Standard', and to the left we can identify 37711 'Tremorfa Steelworks' in 'triple grey'. Reviewing my log, 37704 must be the second of the grey locos in the row to the right, and with this are 37691, 37695 and one other which we must not have been able to identify. The other 'RS' example is 37264. The blue locos are two of 37142, 37158 and 37221 (the third blue loco is the one out of shot). 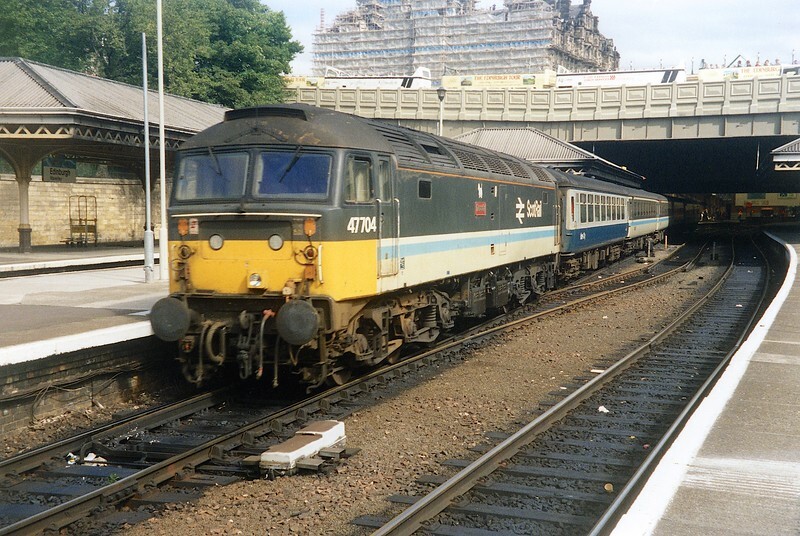 47704 'Dunedin' rests at Edinburgh Waverley on 31st August 1989 having pushed the 1O20 11100 departure from Glasgow Queen Street across to the Scottish capital. The loco wears the attractive ScotRail colours, as do most of the coaches, and note that the third vehicle is one of the Mark 2D TSOTs. 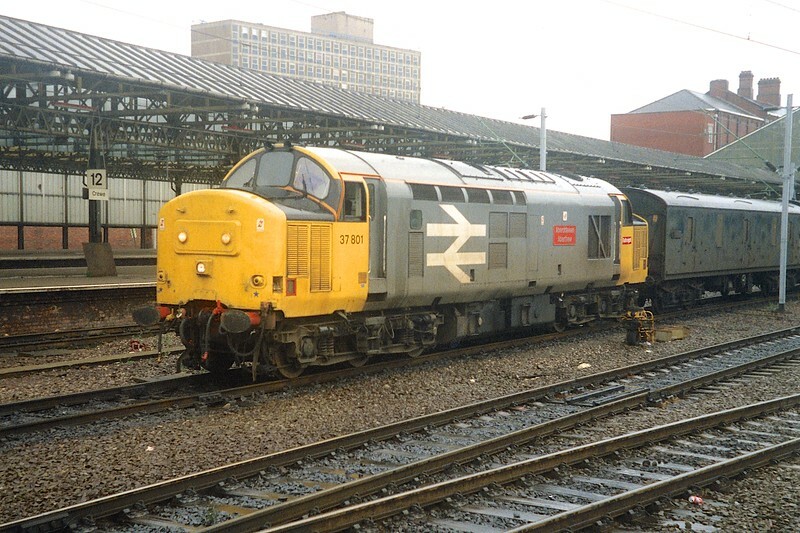 37801 'Aberddawan / Aberthaw' was an odd choice for what appears to be a parcels train at Crewe station on 16th September 1989. The class 37 refurbishment with renumbering was complex. 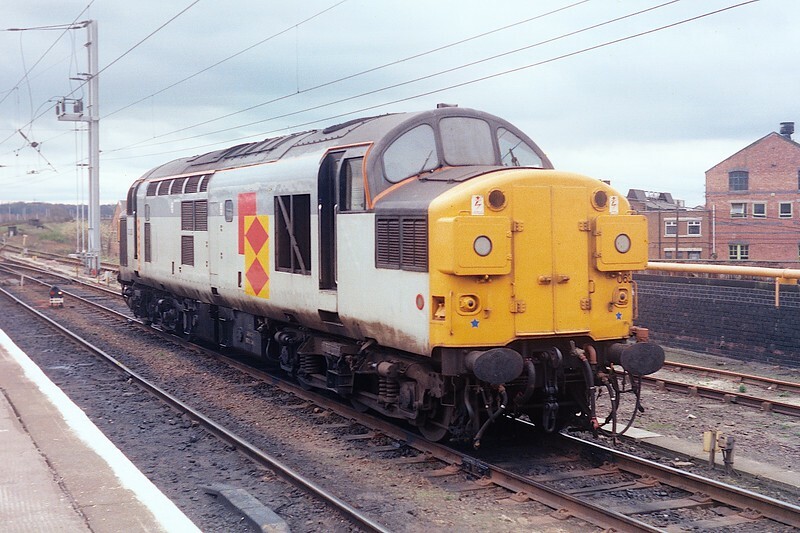 The 37/8 series upwards from 37800 was for series 2 (centre-headcode) locos that were ballasted and had Brush electrical equipment; just comprising 37800-37803. This is one of the class that would later work in Spain. The 1O12 0850 Glasgow Central (/ 0825 Edinburgh) - Poole is running over an hour late when seen at Warrington Bank Quay on 23rd September 1989. 85026, restricted to 80mph at the time, is in charge - presumably following a loco-failure further north. The loco was withdrawn in May 1990 and cut by MC Metals, Glasgow, in January 1993. It's the evening of Monday 23rd October 1989 and London Waterloo is witness to two class 50s in revised NSE livery. To the right, 50043 'Eagle' has arrived with the 1O55 1622 from Exeter St. Davids. 50044 'Exeter', left, makes ready to shunt on to the stock for the next westbound departure. 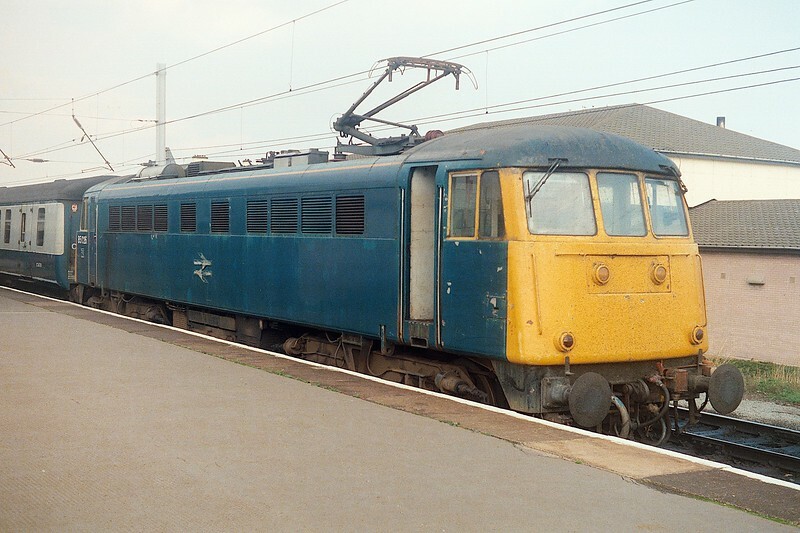 The 25 BRCW 'AM1' electrics, later class 81, date from 1959 and initial electrification of the WCML - 100 locos of five designs were ordered. They outlasted classes 82, 83 and 84 and were finally withdrawn in 1991, the survivors ending their days on ECS trains between Euston and Wembley. 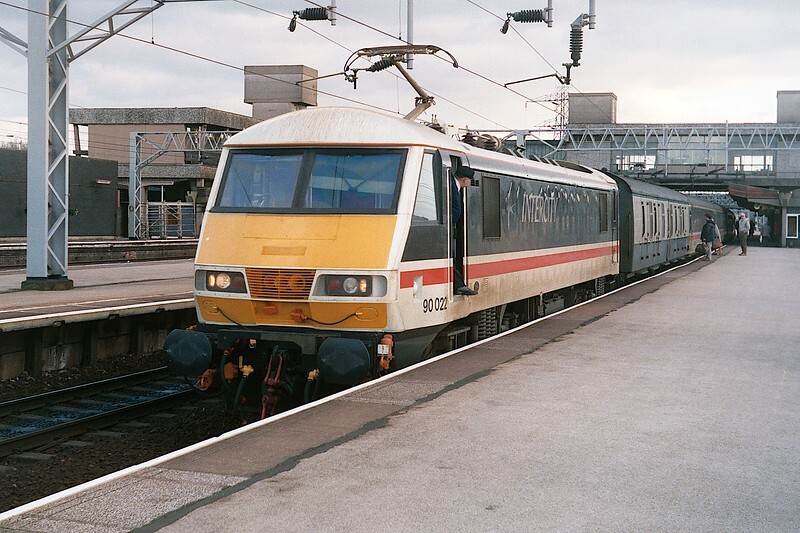 Between such duties at Euston, 81009 is seen on 24th October 1989. For many years they were allocated to Glasgow (Shields Road) depot and 81009 still carries that depot's salmon badge. 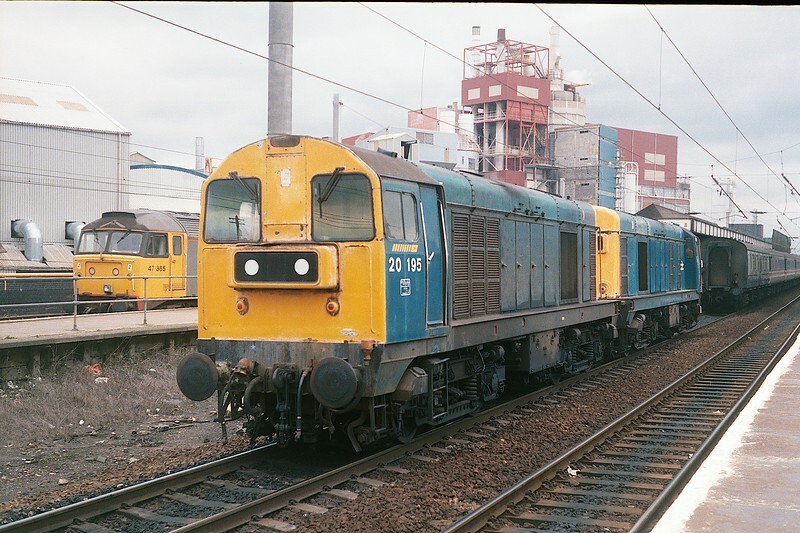 A number of class 33s received Trainload Construction livery, primarily for use in pairs on channel tunnel aggregates traffic. 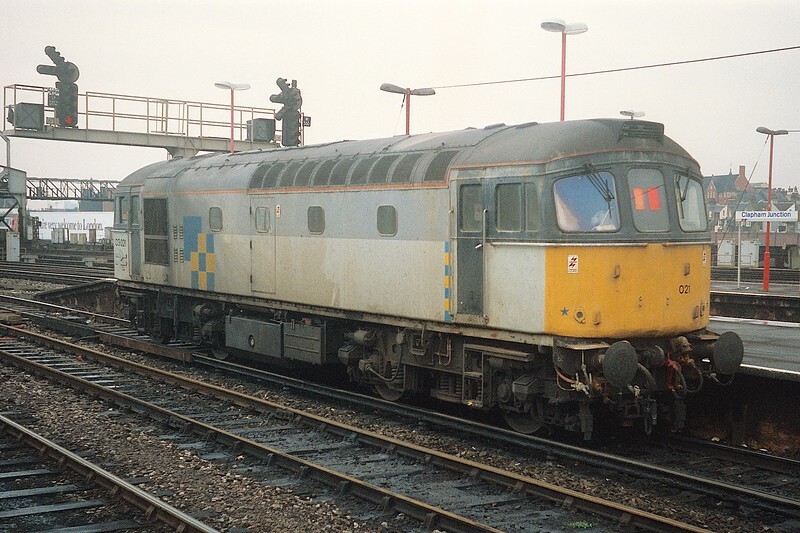 Looking tatty, 33021 is seen passing through Clapham Junction on 26th October 1989. This loco survived into preservation. The peak-hour Clapham Junction - Kensington Olympia shuttle had 73134 'Woking Homes 1885-1985' and 73107 top-and-tailing a 4TC set on 26th October 1989. 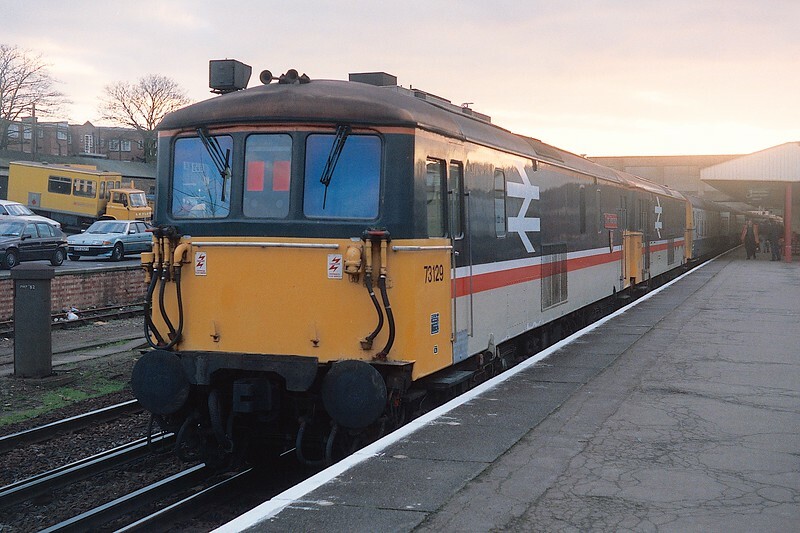 Ten of the 49 class 73s have been scrapped, but 73134 seems unlikely to run again either, being used for spares in the Brush scheme to rebuild the class as class 73/9s.